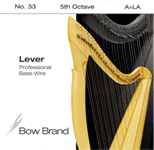 Bow Brand Professional Lever Bass Wires, require less tension - please check if unsure you are using correct diameter. Used on Salvi Donegal, Egan and Livia harps for example. The strings are thicker than standard Bow Brand Tarnsih Resistant Lever Bass Wires. We stock from 5th Octave E to 6th Octave C. Should you require 6th Octave B or A please contact us and we can make a special order for you.